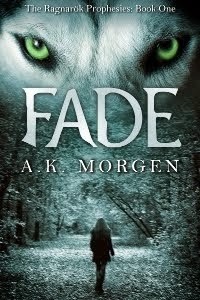 I recently had the opportunity to read both Fade and Fall, books 1 and 2 of the Ragnarok Prophesies, by A.K. Morgen. These are YA novels that I intended to let Little Miss read to give me review input, but I devoured them on my own first. I am glad I did. Fade grabbed me first with it's breathtaking cover. One look and I wanted to know what was up. Arionna Jacobs is a teen on the cusp of adulthood, college bound and ready to take life by the horns. Her mother's tragic death changes everything, forcing Arionna down a different path. That path crashes her into Dace Matthews, making an ancient Norse prophecy reality. It's a story of heartache, fantasy, mythology, trust, love, and self discovery. Arionna felt real to me; the author did a superb job of conveying the characters' emotions in a way that they leap from the page. A strong heroine, Arionna was clever and handled the craziness in her life better than many adults probably would. Dace is a shape-shifter, he shifts into a wolf. As a result, he is complicated and comes off as jerk at times because of the primal nature of his wolf. Both grab you and take you along with them through a book that was never quite like I thought it was. Each time I thought I had it figured out, I found I was wrong, yet thrilled that was the case. I thoroughly enjoy books like that. Fall dives right in where Fade ended. Not only do we see more of Ari and Dace, but other characters are better developed to the point you feel you are reading about your friends. Ronan I absolutely love, something about him enchants me. A story of courage, sacrifice, and love, the plot unfolds in such a way that you are flipping pages like mad, needing to see what happens next. All I can say about the ending is I need book three NOW! I have been pretty vague in my descriptions here because I keep wanting to include spoilers. Since reading them drives me nuts, I refuse to do that to y'all. The stories are great reads. They combine Norse mythology, adventure, paranormal elements, and romance in such a way that the story is compelling. I will say both books started out a little slow, but eventually grabbed me and sucked me in. There is an insta-love aspect to the story, BUT as the plot unfolds it makes sense. Don't judge it by that and think it's just another YA supernatural romance. A.K. Morgen delivers much more than that in these gems. I recommend both Fade and Fall to any YA lover.